Macular degeneration is a disease that affects a special layer of cells in the eye called the retinal pigment epithelium. This layer of cells is underneath the retina. 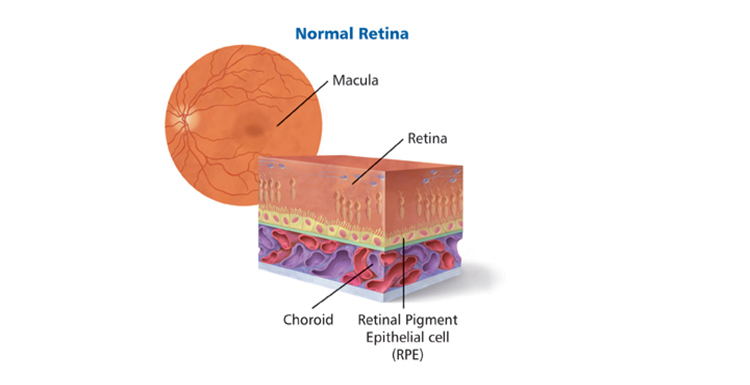 The retinal pigment epithelium (RPE) is like a wall or barrier and is responsible for passing oxygen, sugar and other essentials up to the retina and moving waste products down to the blood vessels underneath (these vessels are called the choroid). The RPE also acts as a barrier between the choroid and the retina. The early and intermediate stages of macular degeneration are the best time to detect the disease. 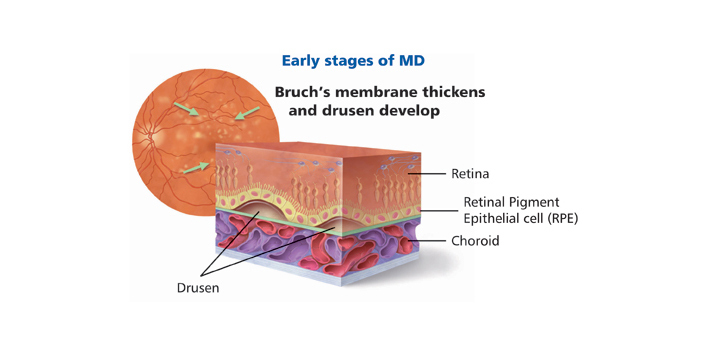 This is when waste products from the retina build up beneath the RPE and form yellow spots called drusen. It is very important to have an eye test and the macula checked because drusen can build up un-noticed. An optometrist or ophthalmologist will examine the back of the eye for drusen using specialist optometric equipment. Small amounts of drusen do not necessarily cause visual symptoms. Not everyone with drusen will lose their vision. However, its existence does increase the chance of macular degeneration associated vision loss developing later. People in the later stages of macular degeneration will experience loss of vision. This occurs because the RPE cells die, or because they fail to prevent blood vessels from the choroid from growing under the retina. When RPE cells die, the retinal cells above them also die, leading to patches of ‘missing’ retina. This is commonly called geographic atrophy or dry macular degeneration, which is a slow form of the disease that causes a gradual loss of vision. It accounts for around one third of all cases of late-stage macular degeneration. Some people who have dry macular degeneration can later develop the more aggressive wet form. This makes it important to report any sudden changes in vision to the the ophthalmologist as a matter of urgency. Any delay in treatment can risk vision loss. Wet macular degeneration is the most severe form of the disease. Every year approximately 21,000 new cases are diagnosed in Australia. Vision changes associated with wet macular degeneration are often sudden and severe. 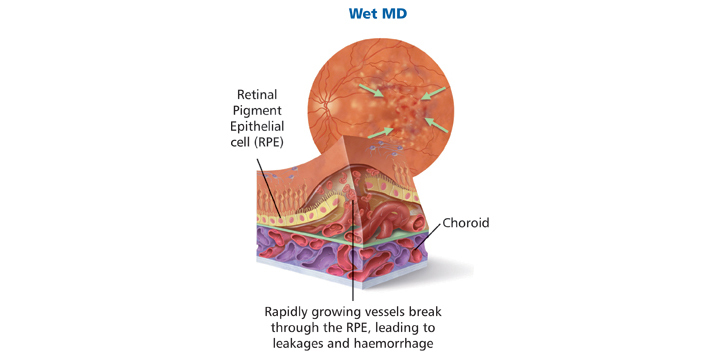 Wet macular degeneration occurs when the RPE cells fail to stop choroidal blood vessels from growing under the retina. This growth is called choroidal neovascularisation or CNV. The rapidly growing vessels are fragile with leaky walls and they ooze fluid and blood under the retina. This leads to scarring and severe loss of central vision, which if left untreated, becomes permanent.